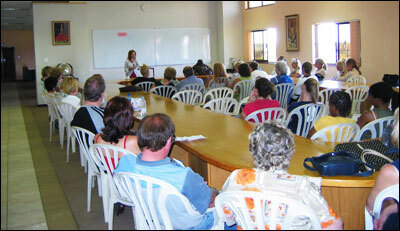 Our Meeting Room can be found behind the Reception area of the Guesthouse. It can seat 50 people around the horse-shoe shaped conference table. Additional people can be seated at the back of the room if necessary. A permanent whiteboard is on the wall at the head of the table. Microphones can also be provided, should you so wish. There is also a small kitchen and cloakrooms in the immediate vicinity.